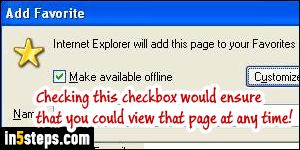 Older versions of Internet Explorer used to let you add a web page to your favorites, and make it "available offline". 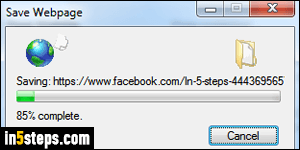 That meant that if you were not connected to the internet, or if the page no longer existed online, you'd still be able to pull it up and let you view it. Unfortunately, Microsoft has removed that functionality, for no good reason I can think of! 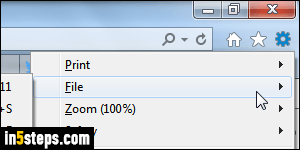 To do the same thing in IE11 / IE10 / IE9, you have to save a copy of that web page on your computer. Unlike Word documents or PDFs, web pages include lots of "assets": images are referenced, nearly never embedded in the file; the appearance of the page is defined with external style sheets; the behavior (interactivity) of the page is usually saved in external script files, etc. So, what you're seeing as a web page is actually a collection of files, bound together using "HTML", the language that is used to create websites. All that affects the web page will be saved! Once the web page you want has loaded, you can save it by hitting the Ctrl+S keyboard shortcut (same as all Windows programs!) 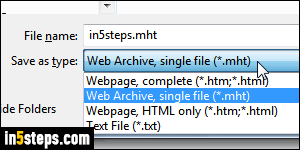 Otherwise, if you restored IE's classic menus, click on the File menu and choose "Save as". If you haven't, click on the gear icon (top right corner) and go to File > Save as. - "Webpage, complete" saves the page's content as an HTML file, and create a folder with the same name, with copies of all "assets", including images, that compose that page. Keep the file and its folder stored in the same location! 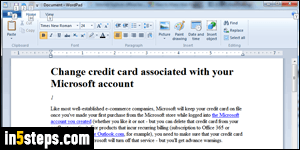 - "Webpage, HTML only" saves a formatted text of the page, without images. - "Text File" saves the web page as plain-text: no images, no formatting!